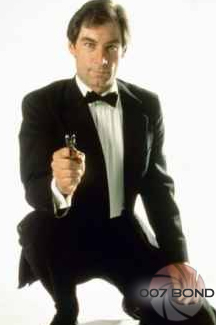 Timothy Dalton approached the role of Bond with the desire to bring the character of 007 as written by Ian Fleming to the screen. Dalton made the role his own by rereading all the Fleming novels and emphasizing the undercurrent of bitterness and ruthlessness that he felt defined the literary Bond while still embracing Bond's elan and extraordinary skills and determination. Timothy Dalton was born in the coastal town of Colwyn Bay in North Wales where his father was stationed during World War II. The oldest of five children, Dalton came from a show business family. Both of his grandfathers were vaundevillains, while his grandmother was a theatrical agent who was once a variety performer with Charlie Chaplin. In the late 1940's, Dalton's father moved his American wife and growing family to Belper in Derbyshire, England, near Manchester where he could work in advertising. This is where young Dalton soon found himself attracted to the cinema. Dalton remembers seeing The Red Beret in 1953, and imitating the soldiers with his friends. The Red Beret was the first UK production of the future Bond producer Albert R. "Cubby" Broccoli. At the age of 16, Dalton saw a production of Macbeth at the famous Old Vic theatre and decided that he wanted to become an actor. "I tried to bring the movies back to something that was more like Ian Fleming"
Dalton began his training at London's Royal Academy of Dramatic Art (RADA) in 1964 and spent his summers studying at the National Youth Theatre. He made his debut on stage in Shakespeare's Coriolanus at the Queen's Theatre. He left RADA after almost two years and joined the Birmingham Repertory Theatre. Actor John Rhys-Davies, a classmate of Dalton's at RADA and later his co-star in The Living Daylights, has commented on Dalton's incredible sexual presence on stage during the late 9060s and how women would wait outside the stage door for him. It wasn't long before movie producers came calling. He made his film debut in 1968's The Lion In Winter, starring Peter O'Toole and Katherine Hepburn, and went on to star in such films as Wuthering Heights (1970), Cromwell (1970), and Mary, Queen Of Scots (1971). Dalton commented in 1987 that after these films, he had felt "the need to go back to the stage." Devoting himself to the theatre, Dalton made only one film between 1972 and 1978. In 1987, after being cast as Bond, Timothy Dalton spoke about his long path to slipping on the shoulder-holster. "When I was about 25, Mr Broccoli kindly asked me if I would be interested in taking over from Sean Connery who was about to relinquish Bond," he recalled. "It was not a firm offer, but an expression of interest. Frankly, I thought it would have been a stupid move for me. I was too young - Bond should be between 35 and 40 years old." Dalton continued acting, playing a wide variety of roles. "Then, several years ago, when Roger Moore was uncertain about continuing as 007, I was approached again. The situation was very vague, there wasn't a script yet, and I had already been asked to do Flash Gordon. But I was pleased to have been considered. When I was asked in early 1986, I was unavailable. I was doing my own stage production of Antony And Cleopatra and The Taming Of The Shrew so the schedules conflicted and the idea went out the window again." Dalton's inability to sign in early 1986 led the filmmakers to pursue Pierce Brosnan, but when Brosnan proved unavailable owing to the renewal of his Remington Steele television contract, producers Cubby Broccoli and Michael G Wilson returned to Dalton, who again had conflicts, as he was working on the film Brenda Starr, released in 1989. The producers agreed to delay the start of production of The Living Daylights if Dalton accepted, becoming the fourth 007 in Eon Productions' Bond series. "I don't think anyone except the few people who have played James Bond can tell you how strange and special it is." From the set of the TV mini-series Scarlett in April 1994, Dalton announced that he would not portray James Bond for a third time. He continued to alternate between film, television and stage work. Highlights included the comedy The Beautician And The Beast (1997), the western American Outlaws (2001), the animated/live action film Looney Tunes: Back In Action (2003), the television epics Cleopatra and Hercules, the comedy Hot Fuzz (2007), and the classic Toy Story 3 (2010). His most noted stage work of recent years is Phillip Pullman's His Dark Materials, in which he portrayed Lord Asrael at London's National Theatre. Dalton lives in Los Angeles and has one son, Alexander. His favorite pastimes include fishing, opera, and jazz.